While you may have started your website for a number of reasons, monetization is likely one of your main goals. After all, your website provides you with the perfect platform to reach out to thousands of consumers. However, monetization can be a difficult process to start on your own, especially if this is your first foray into the industry. Fortunately, programs such as Google AdSense make it easy to earn money on your website or blog with very little effort. In fact, you can begin to turn a profit almost instantly when you sign up to be an advertiser. In this post, we’ll introduce you to Google Adsense, explaining what it is and how it works. Then we’ll outline a simple, three-step process that can get you started using the program on your own site. Let’s take a look! A popular website monetization program, Google AdSense is a great option for beginners and professionals alike. Google AdSense is a program from Google that enables marketers (referred to as publishers within the program) to seamlessly display advertisements on their websites and blogs. Its main purpose is monetization, and you can use it to make money with WordPress by simply placing specialized ads on your website. Credibility: As a world-renowned company, you can’t get any more more credible than Google. Versatility: AdSense offers a variety of ad types, including text, image, rich media, video, and audio. Flexibility: This program works with a variety of platforms and other tools, including WordPress and Blogger. Before you jump right in, AdSense does have a number of policies you’ll want to review. There are also a few requirements for its advertisers. For example, you must have a well-established website (at least six months old), and you have to be 18 years of age or older. If you’re ready to get started with AdSense, you’ll be glad to learn that the process is simple. In fact, it can be completed in just three steps. Since AdSense is a program on the Google platform, all you need is a Google account to get started using its variety of features. When signing up for Google AdSense, you have two options. You can log in with an existing Google account, or you can create a new account. Once you’ve signed in (or completed the sign-up process), you’ll be brought to the next step in the program. As with any affiliate program, you will be required to fill out an application. Fortunately, the process is straightforward and can be completed within minutes. We recommend that you start by reading through and understanding AdSense’s policies and terms. While this is a step you may be tempted to overlook, it’s important to know exactly what Google expects from its users. This is because you’ll be required to follow all policies and guidelines if you’re approved as a publisher. Next, you can fill out the three-part application. You’ll first need to enter some basic information, such as your website URL. Then you’ll be asked to provide your payment address details (so AdSense can send you payments and important account information). Finally, you’ll be required to verify your phone number. Once the code is added to your site, check the box that confirms the action has been completed, and click Done. Now, all you can do is wait patiently. The review of your application can take anywhere from 48 hours to two weeks, and you’ll receive an email once the decision has been made. While you’re waiting to hear back about your application, you may want to consider adding an AdSense plugin to your site. One of the benefits of AdSense is that you can use it on just about any website, and there are many available tools that can improve its functionality. This holds true for WordPress, since the larger community offers a number of plugins that can be installed on your website and connected to your AdSense account. It is possible to place AdSense ads on your website without a plugin. Essentially you’ll need to create and copy your ad code into a text widget or a theme ad-banner spot (like the banners built into the Spartan magazine theme that can be edited via the WordPress customizer). This is a solid option for those who’d rather not include another plugin on their site (as plugins do take up space). However, the manual approach can be involved, especially if you want to vary the placement of your advertisements. With a plugin, the process is more streamlined. Plus, you’ll get better control over ad display positions. 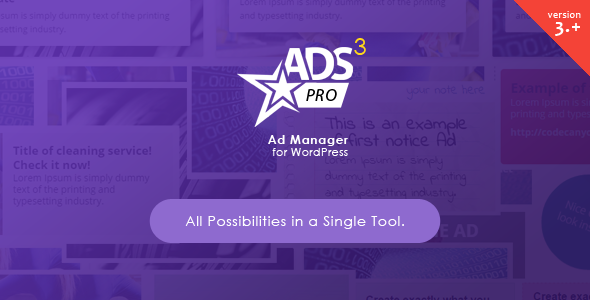 If you want the most tools to create, manage and track your advertisements then the Ads Pro Plugin is your best bet. This premium plugin offers tons of features for ad styles, popups, social integration, scheduling, geo-targeted ad campaigns, online statistics and more. So not only can your monetize your website with Adsense, but you can sell you best converting ad spots to specific clients at a higher price. This plugin certainly lives up to its name, as it makes WordPress AdSense Insertion ads simple and painless. Its main feature is its shortcode functionality, which enables you to insert ads by copying and pasting plugin-generated shortcodes almost anywhere on your site. A plugin with a few more advanced features, this is an excellent choice for anyone looking to fully customize their ad placements. Notable features include full responsiveness, and the option to set visibility conditions. Whether you choose to use a plugin or not is based on your preferences. Still, it won’t hurt to give one of the above plugins a try! You don’t have to be a marketing genius to earn money on your website. With a few well-placed ads, you can monetize your content and start making a passive income. Plus, a dedicated program such as Google AdSense can get you started quickly and with little effort. Sign up with Google AdSense. Complete the AdSense application process. Optionally, install an AdSense-compatible plugin on your site. Do you have any questions about how to use Google AdSense for monetization on your WordPress site? Let us know in the comments section below!